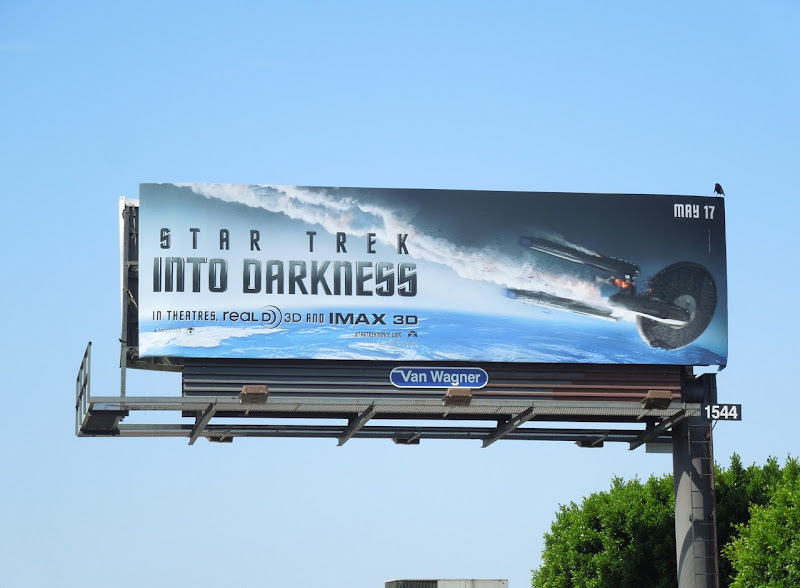 What a year for science fiction it's turning out to be, with the likes of new movies Oblivion and After Earth, plus fan favourites like the sequel to the rebooted Star Trek cinematic franchise returning to the big screen. 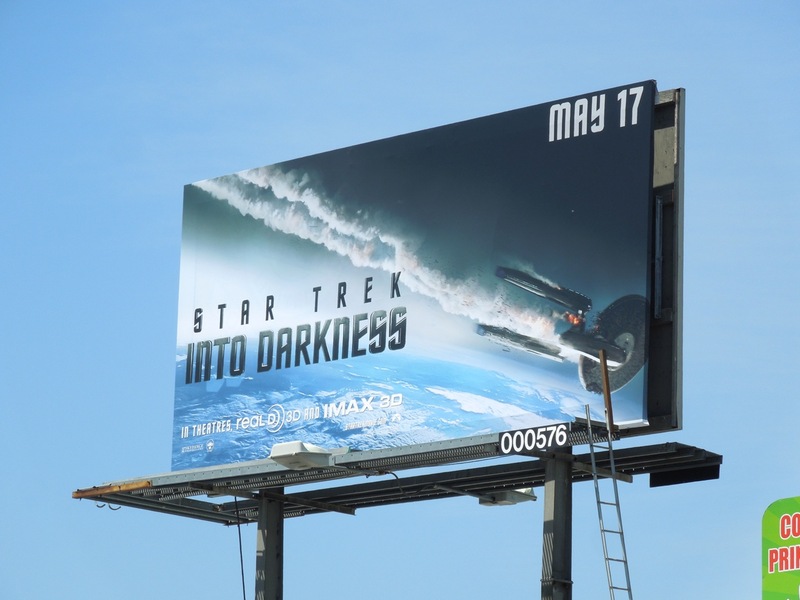 Star Trek Into Darkness sounds a bit ominous and these cool billboards with a damaged USS Enterprise falling out of the sky certainly hint at tough times for her crew. 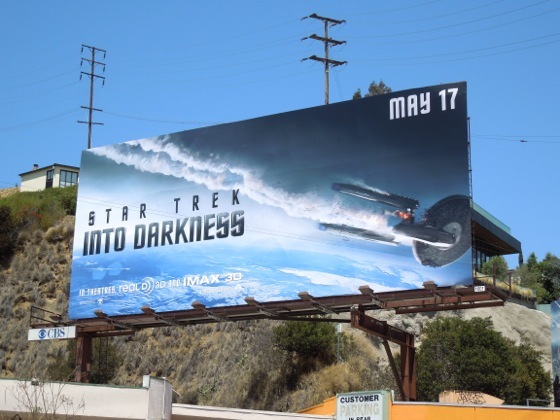 It's interesting that Paramount has decided to focus of the iconic starship again for the film's ad campaign, after all it's not the first time we've seen the Enterprise crash. 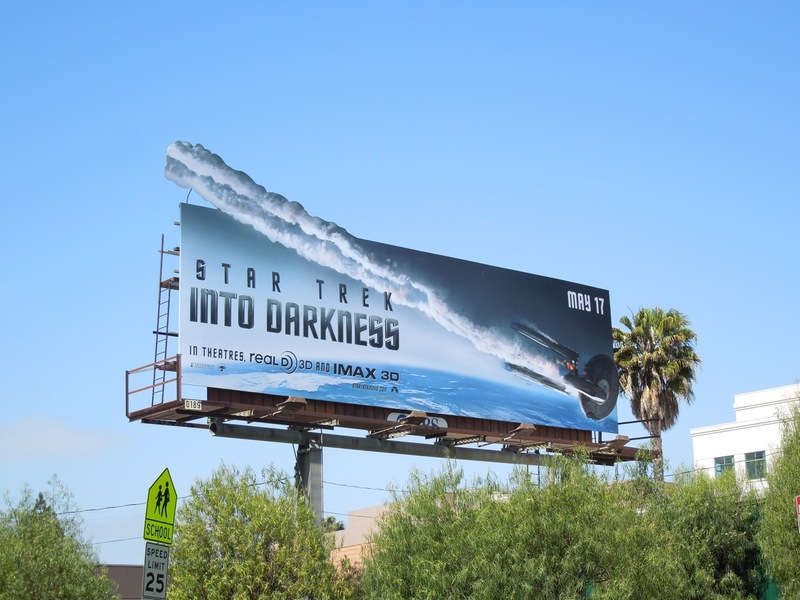 Maybe they don't think Chris Pine's young 'Kirk' and Zachary Quinto's 'Spock' are as bankable, or instantly recognisable, to sell the movie (or maybe Daily Billboard is being too hasty and this is simply the opening salvo in their advertising campaign). 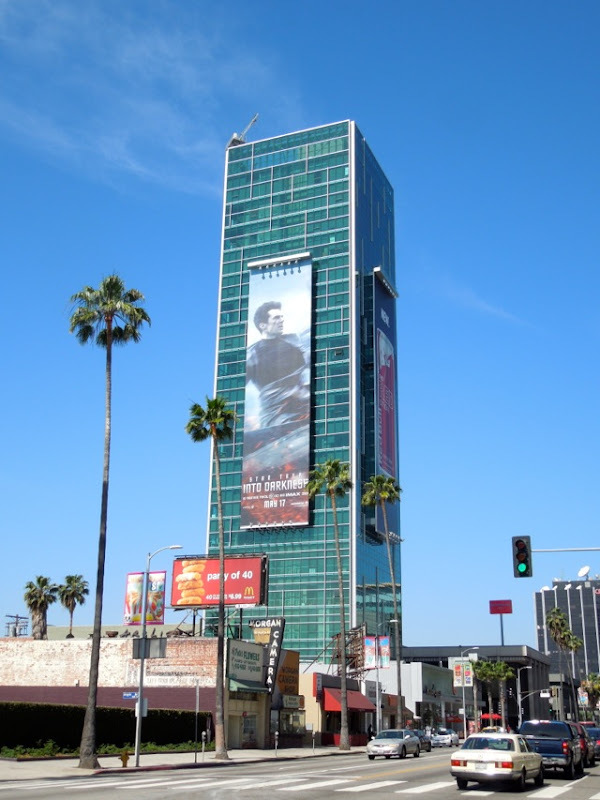 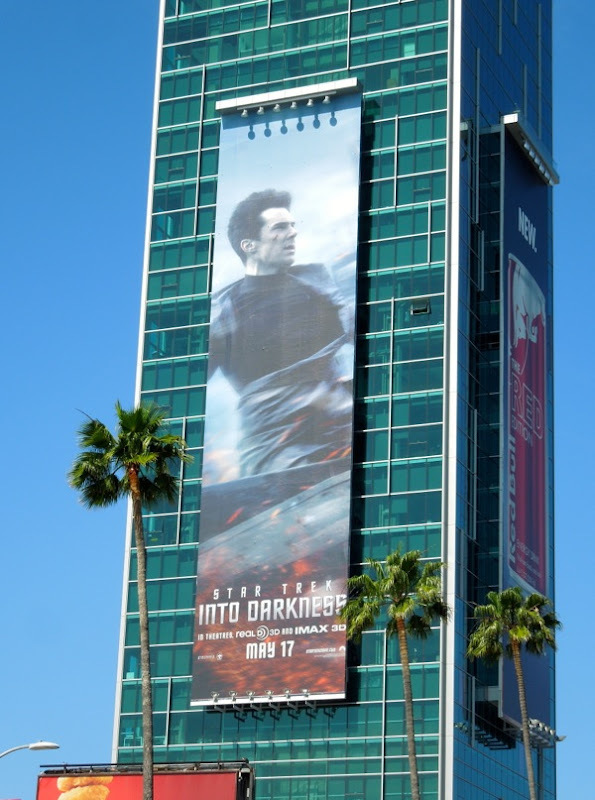 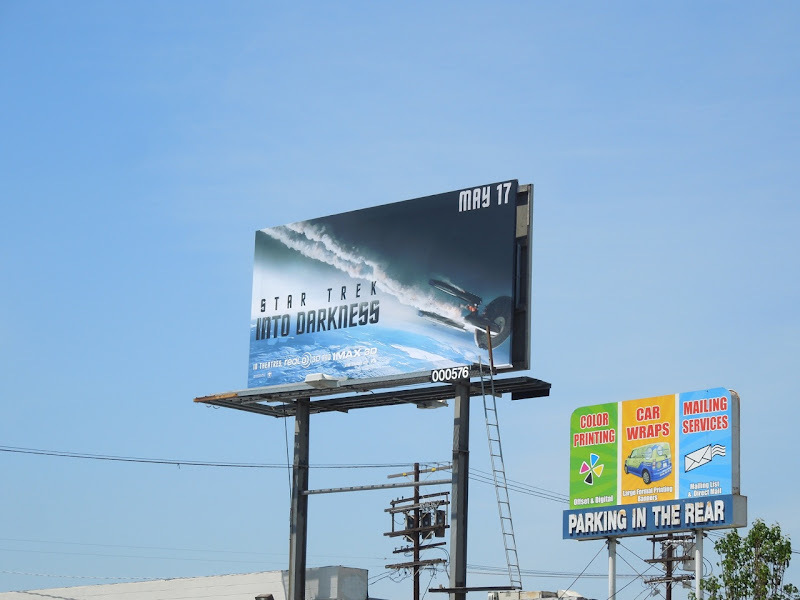 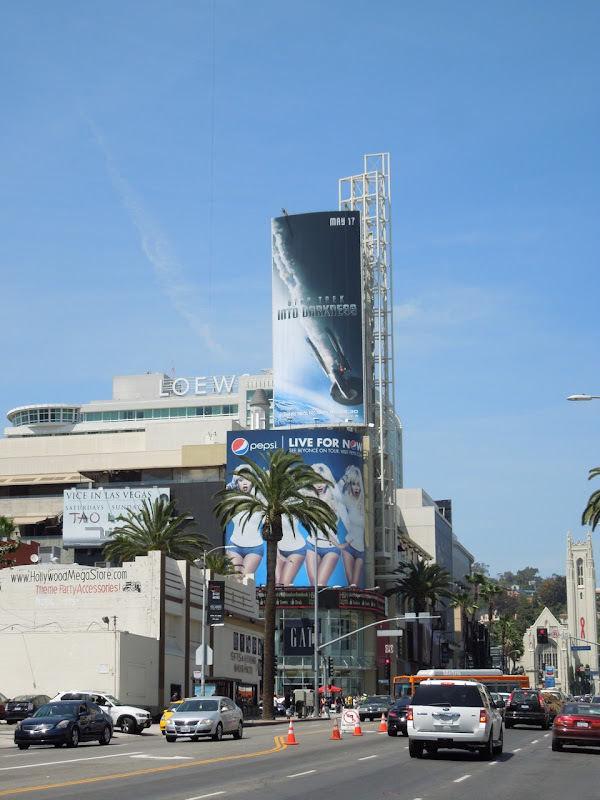 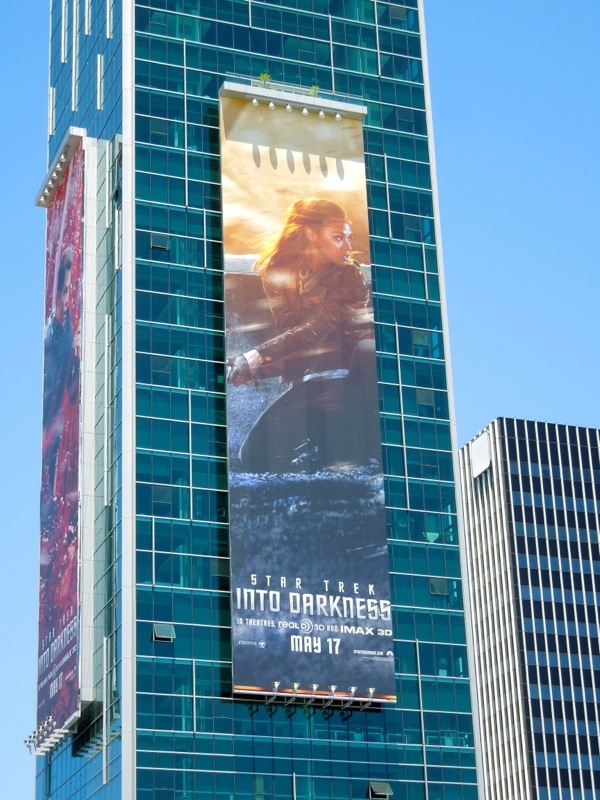 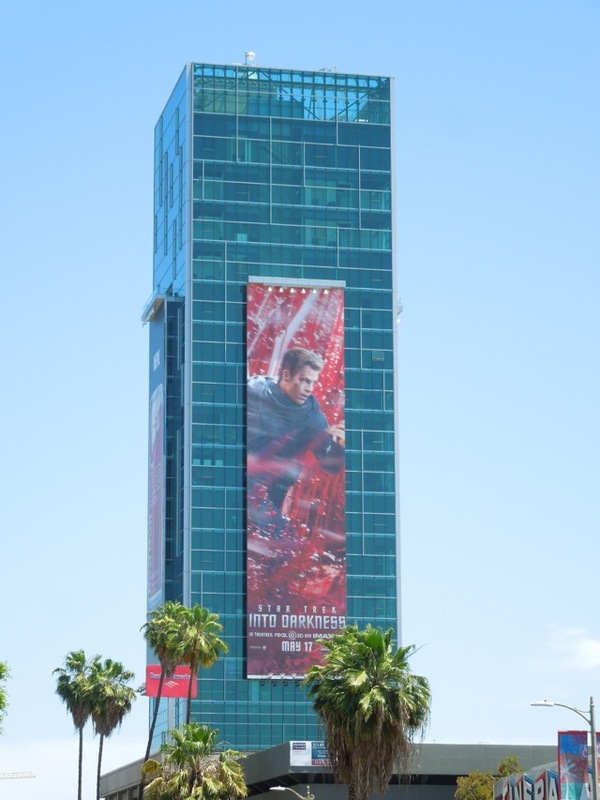 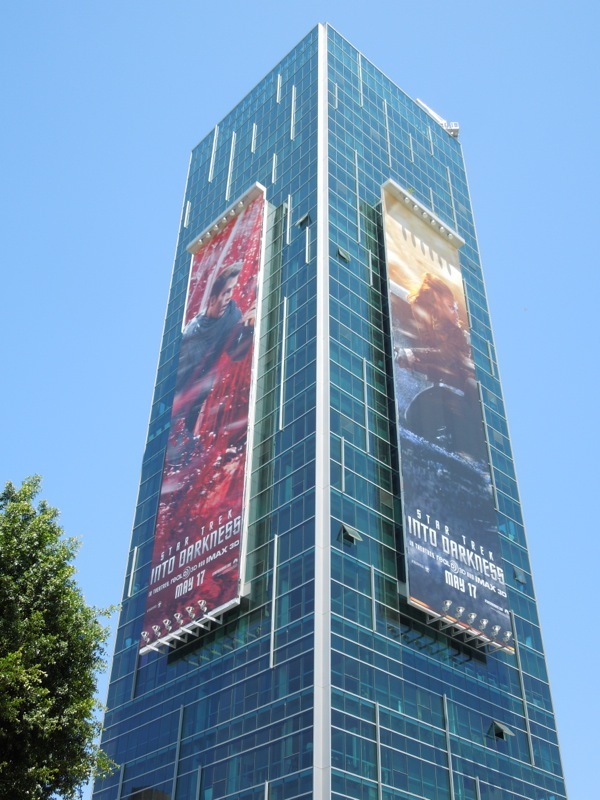 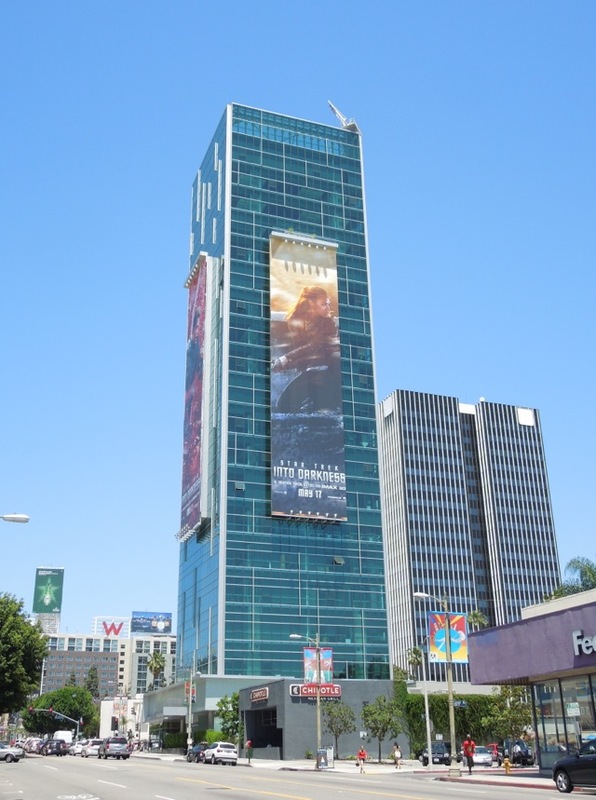 These Star Trek Into Darkness billboards were spied along Santa Monica Boulevard and Highland Avenue on April 22, 2013. 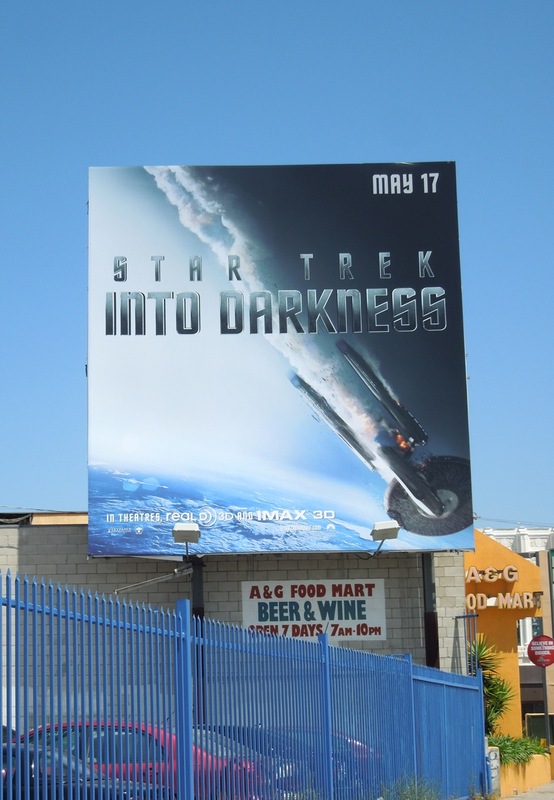 If you're a fan, be sure to check out these fantastic 2009 Star Trek movie billboards, plus these original costumes and props from JJ Abrams Star Trek movie reboot. 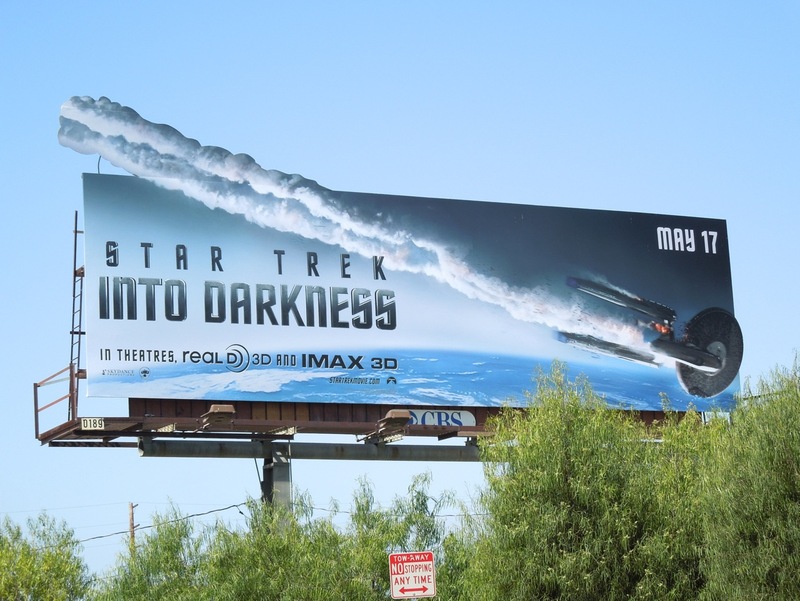 Warp speed ahead to a spectacular sci-fi Summer. 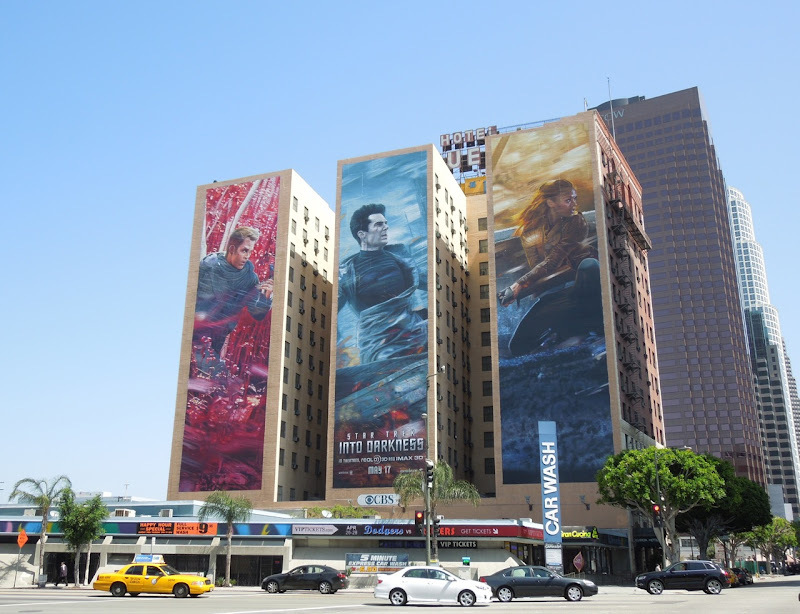 UPDATED: It seems that Daily Billboard did speak too soon about Paramount's campaign for the new Star Trek sequel, as this spectacular trio of action-packed character billboards was spied on the side of the Figueroa Hotel in Downtown L.A. on April 27, 2013. 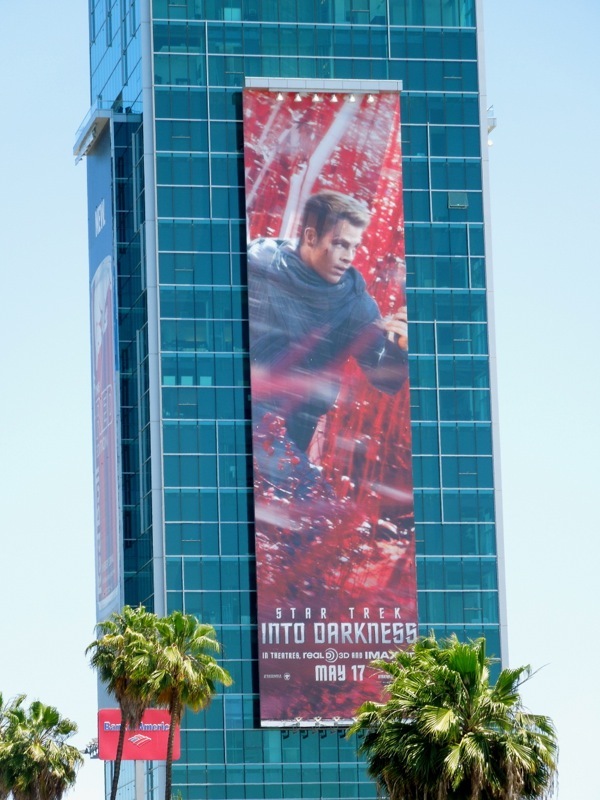 Interestingly these wall murals feature Chris Pine as 'James T. Kirk', Benedict Cumberbatch as the film's villain (rumoured to be 'Khan') and Zoe Saldana providing a strong female presence as 'Nyota Uhura', but where's 'Spock'? 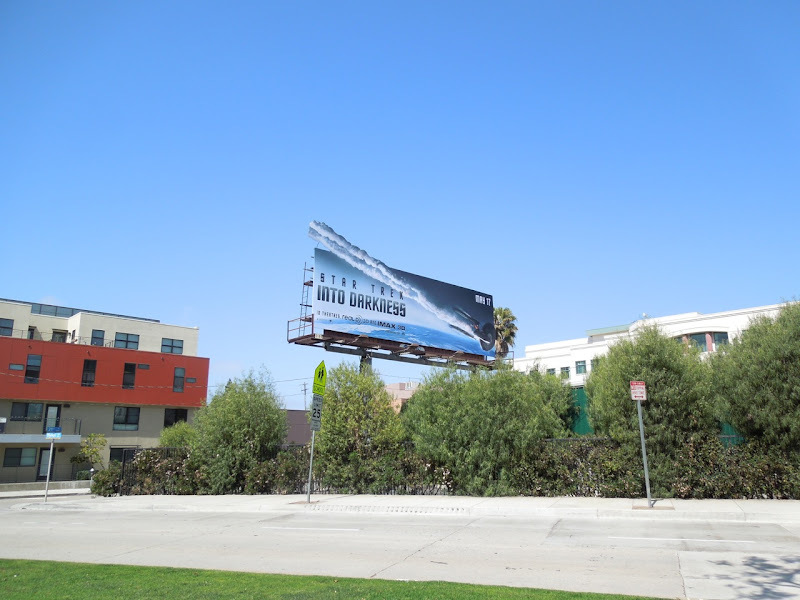 With the help of CBS Outdoor Los Angeles, Daily Billboard also spotted this striking plasma-venting special extension billboard along Olympic Boulevard at 21st Street in Santa Monica the same day. You have to agree that this billboard has great visual impact - set phasers to stunning, indeed. Plus finally, here's a squarer billboard version of the falling starship, snapped along La Brea Avenue, which also has great standout. 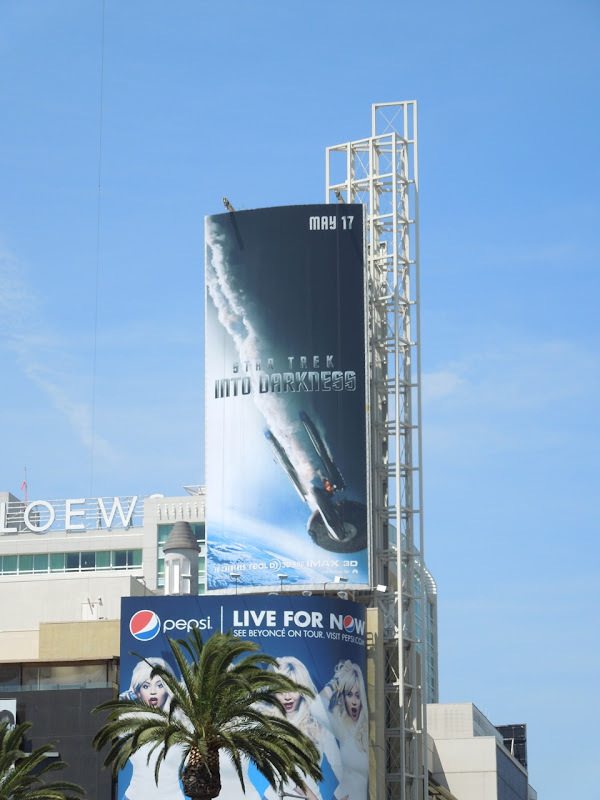 UPDATED: Here's another larger billboard for the sci-fi sequel snapped in one of the prime advertising locations along L.A.'s busy Sunset Strip on May 2, 2013. 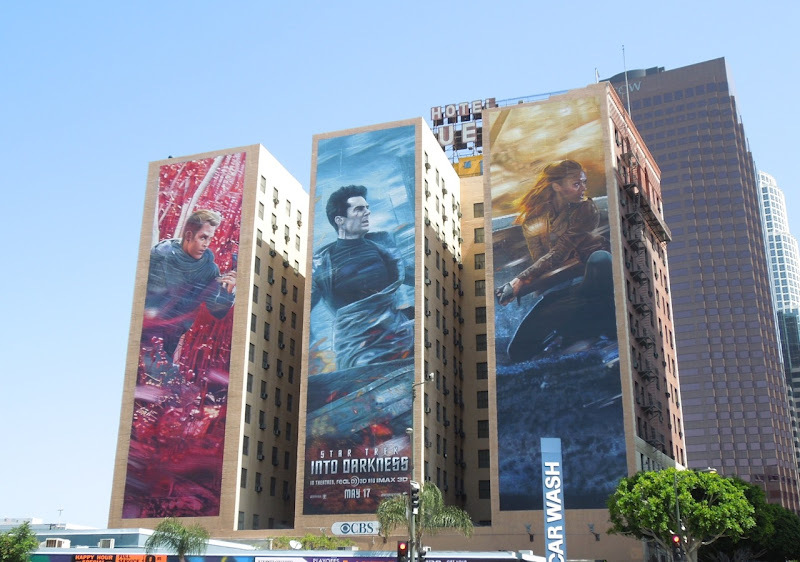 UPDATED: Here are the three images that adorned the Figueroa Hotel in Downtown L.A., but this time on three sides of Sunset Vine Tower in Hollywood on May 14, 2013. 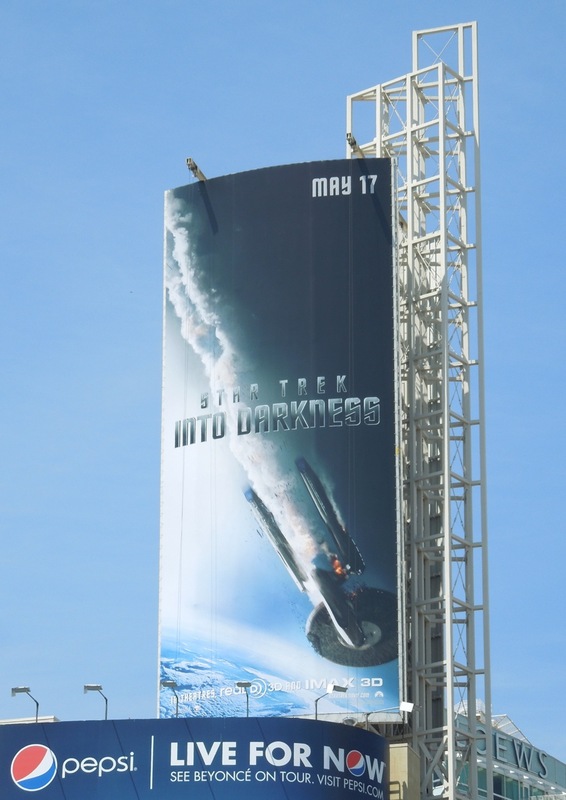 If you love these giants ads, be sure to click on through to see original movie costumes worn by Benedict Cumberbatch and Chris Pine in Star Trek Into Darkness on display. 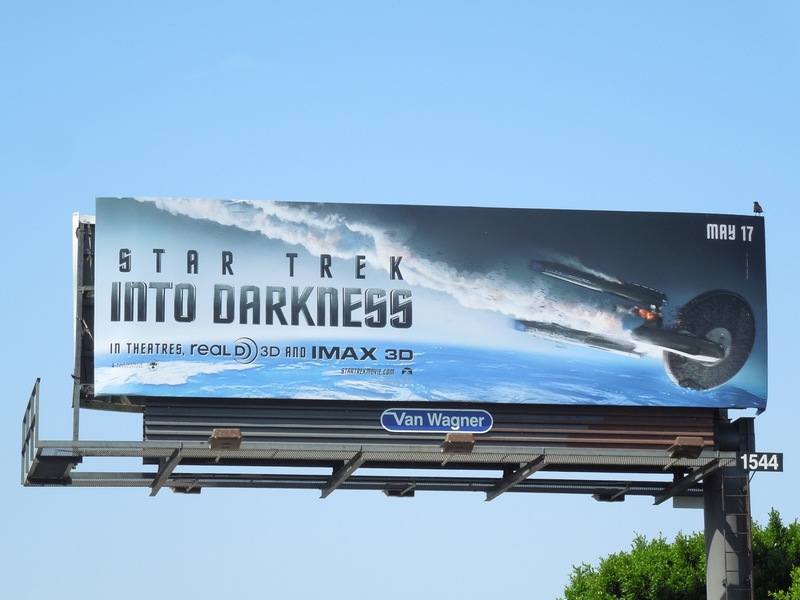 Let's hope the Star Trek movie sequels continue to live long and prosper.